This short video from the Toothflix® 2.0 patient education video series breaks down the components of having a veneer procedure. Veneers describes which concerns veneers address and how they improve the appearance of teeth for better color, shape, and size. In addition, patients will learn the benefits of both porcelain and composite veneers while prompting discussion of which material is right for them. You can utilize this video as a resource to educate your patients about cosmetic dentistry with stunning visuals and real transformations. Patients looking for an improved smile have many cosmetic options; this video will provide valuable information about veneers so your patients can make an informed decision. After seeing this video, patients will have a high-level understanding of veneers, the process, and what to expect. To take advantage of this great educational resource, all you need is a web-enabled device – no more clunky TV carts, overflowing video boxes, or old-fashioned DVD players. Each Toothflix video you purchase is instantly accessible through your online ADA e-bookshelf. To learn more about the Toothflix video series, visit ADA.org/toothflix. 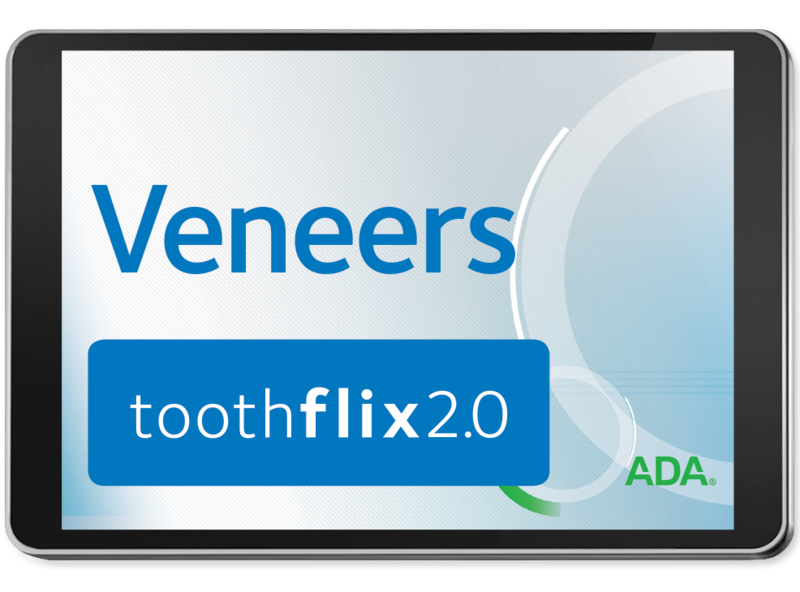 Purchase your Veneers – Toothflix® 2.0 Streaming Video today!